Broadly speaking there are two types of integrations with Salesforce, either a system-to-system integration or a user interface integration. 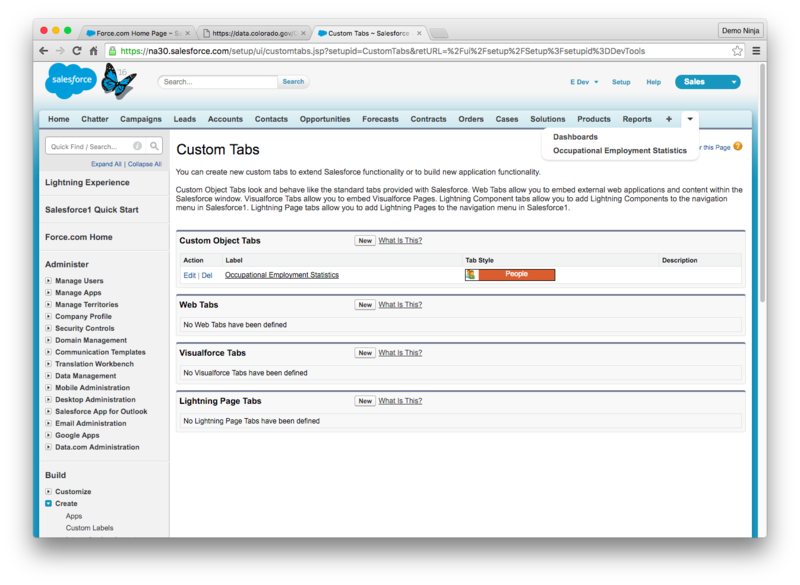 One of the primary ways to do these integrations is by using the Salesforce REST API. 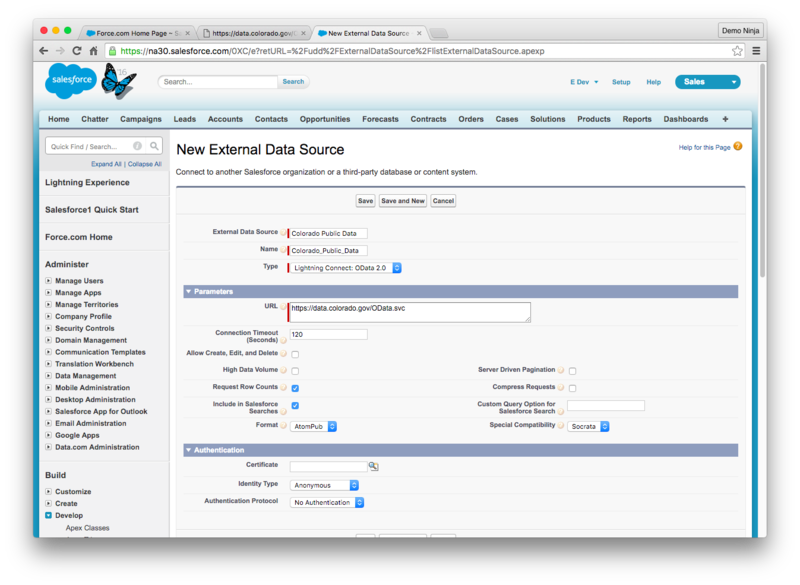 When using the Salesforce REST API you need to obtain an access token that identifies who is making the requests. OAuth 2 provides an HTTP interface to obtain a Salesforce access token. Use the Web Server Flow where a Salesforce user in a traditional web app is asked to authorize a third party application which then allows the web server to obtain an access token. Use the Username and Password Flow where stored credentials for a system-to-system integration user are exchanged for an access token. The OAuth Web Server Flow can seem tricky to implement by hand because there are a number of necessary steps but luckily this flow is pretty standard so many libraries have done the hard work for us. In the case of a Java Spring application the hard work has all been done by the Spring Security OAuth library. And Spring Boot makes it super easy to setup a new application that has everything needed for the OAuth Web Server Flow. There you can see dependencies on the Spring Boot stuff, the Spring Security OAuth library and a few WebJars for the UI. I put all of the settings except the client id and secret in a src/main/resources/application.properties file. For the other settings you can use environment variables or config settings on Heroku. Spring Boot automatically will look for the client id and secret in environment variables named SECURITY_OAUTH2_CLIENT_CLIENT_ID and SECURITY_OAUTH2_CLIENT_CLIENT_SECRET. 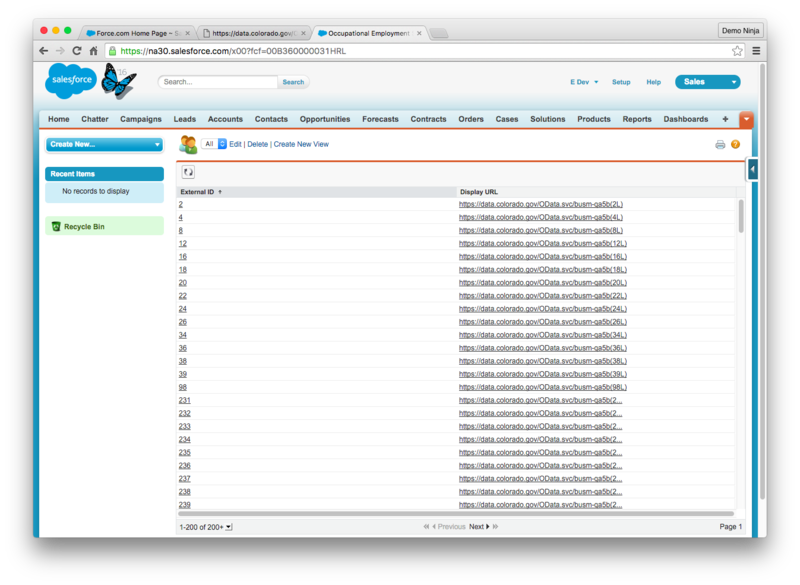 There is some plumbing to setup the Spring REST Template which makes it easy to make the REST requests. The accounts method takes an OAuth2Authentication so that the URL can be determined. Finally there are some classes to represent the results from the query and the Account, which are created from the JSON data returned from the REST API. This does all the magic to create a Spring Boot web application which uses the Spring Security OAuth stuff, the Force component, and a REST controller. There is a single REST controller method in this application that handles requests to /accounts, does the query to Salesforce using the Force component, deserializes the results, then reserializes them as JSON. In this little example we aren’t seeing why we’d want to proxy the Salesforce REST API in this way since we are not doing any aggregation or transformation of data. But that would be straightforward to do if needed. 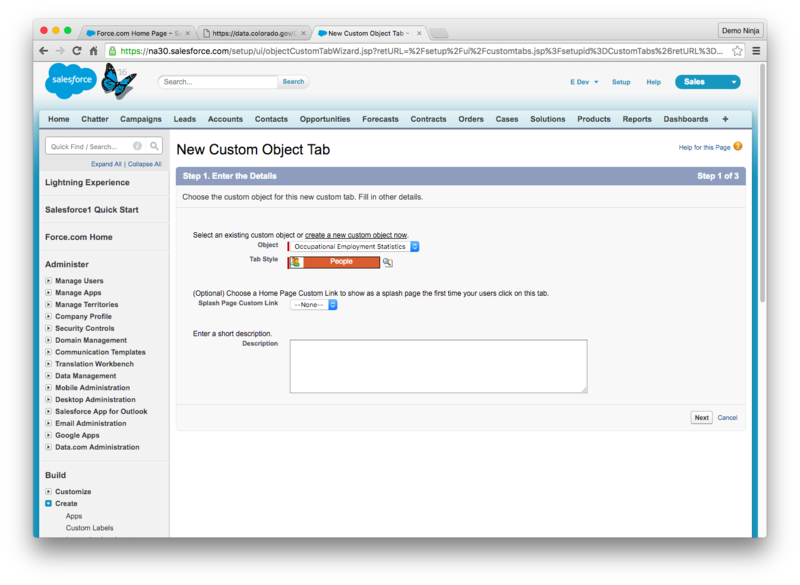 In total there were only five pretty small files needed to have an end-to-end Salesforce REST API integration with a web application. Hopefully that gets you started! For full instructions on Heroku deployment of this application or to get the app running locally, check out the complete project on GitHub. The code is on GitHub so if you’d like to deploy this on your own Heroku app or other infrastructure, you can do that. Let me know how it goes! 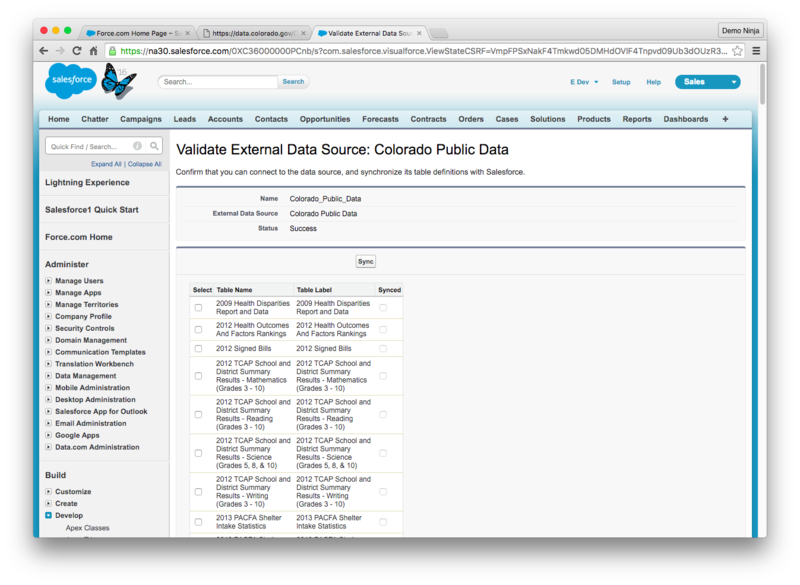 Save the new External Data Source and then hit “Validate and Sync” to fetch the metadata for the services. Select one or more tables from the list. A good table to test with is the “Occupational Employment Statistics” dataset. Sync the table and you should see a new “External Object” in the list of External Objects. Complete the creation of the tab (select Next, Next, Save). Note: The columns displayed in this view can be customized in the External Object’s Search Layout. That’s it! 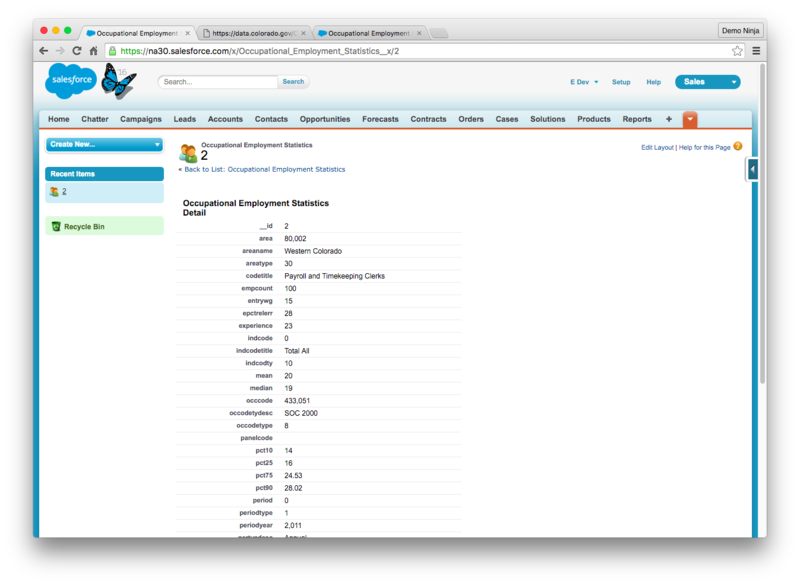 Now you can build all sorts of business processes and other employee-facing interactions around the public data. Good luck to all of the Go Code Colorado teams! Try out Quick Force Java and let me know how it goes! Ok, now give it a try yourself by following the instructions in Quick Force (Node)! I hope this will be the quickest and easiest way you’ve gotten started with the Salesforce REST APIs. Let me know how it goes! FYI: This *should* work on Windows but I haven’t tested it there yet. So if you have any problems please let me know. Combining customer-facing apps on Heroku with employee-facing apps on Salesforce enables a whole new generation of connected and intelligent experiences. There are four primary ways to do this integration: Heroku Connect, Canvas, Apex / Process Callouts, and the Salesforce REST APIs. Using code and architectural examples, we’ll walk through these different methods. You will walk away knowing when you should use each and how to use them. Check out the video recording of the session. I hope this is helpful. Let me know if you have any questions. I’ve put together a quick start Canvas app that uses Java and Play Framework to get you going in minutes. You can either run this app on Heroku or on your local machine. The fewest steps to get everything setup is with Heroku so I’ll cover that first. Heroku is an app delivery platform that works with a variety of back-end programming languages and frameworks. I’ve created a Canvas-ready Java app using Play Framework and set it up for instant deployment. To get started, signup for a free Heroku account (if needed), then launch your own copy of the salesforce-canvas-seed app. Once the app has been deployed, open / view the app and follow the instructions to complete the setup process. You will create a new Connected App on Salesforce that is used to identify the external app. Once you’ve completed the instructions you will now have a fully functional Canvas app, running on Heroku, and written in Java. Your browser may give you a warning about the certificate not being valid, which you should ignore / approve the connection. Then you will see instructions for setting up a new Connected App on Salesforce which will be used for local development. After following those instructions you will have a Canvas app running locally. Now you can begin making changes to the app. That should be everything you need to get started building against the Canvas SDK. For more information on that check out the Canvas Docs. Give it a try and let me know how it goes! BTW: The source is on GitHub.